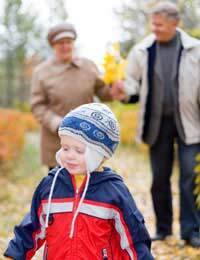 There is a unique connection between most children and their grandparents; consequently as a writer, you may want to take advantage of this special relationship. Indeed, intergenerational creative writing can result in some rewarding, amazing works. Here, we’ll look at some ways for you and your grandsons or granddaughters to join forces and craft imaginative writing pieces that have never before been seen. Whether you live across the street or around the globe from one another, you can still reap the countless rewards of intergenerational writing. This exercise will greatly open your eyes as to how someone much younger than you sees the world. Though you may wax about a bird’s beautiful song during an outing with your special little one, he or she may remember most fondly the fact that there was a bug squished on the pavement! Conversely, your grandson or granddaughter might just discover that grandma or grandpa isn’t a one-dimensional, humdrum person but a visionary who can weave a tale with incredible skill. Not only is this a fun method of learning more about each another, it can also help you tremendously if you want to pursue creative writing that is geared toward a juvenile audience. Do you have a ton of photos lying around your home or apartment? Why not put them into a special binder (one or two pictures per page) in which text can be added? Then, the next time your grandchild comes for a visit, ask him or her to help you write “captions” (or even stories) about the people and/or events depicted in the photos. This exercise can be an excellent way to boost the memories of both your youngster and yourself. What he or she recalls about the holiday you all spent at the seaside (“Gramps… wasn’t it funny when that dog kept trying to lick off the baby’s sunscreen?”) or your sister Abigail who passed away last year (“Great-aunt Abby always smelled liked roses… I liked that!”), you might have forgotten. Such co-writing ventures can wash away a rainy afternoon and you’ll have a lovely souvenir to keep as a result of your collaborative creative scribblings. Should you be one of the many grandparents who lives far away from your grandchildren, never underestimate the power of the cyberspace. Through the wonderful medium known as e-mail, you and your grandson or granddaughter can exchange writing ideas and commentary. It will be up to your grandson or granddaughter to finish the thought and start a new paragraph. This running exchange could even become a short story written by both of you if it has enough energy and excitement. You can also ask your preteen, teen, or young adult grandchild to help you edit your recreational or professional writing pieces if he or she is particularly good at providing critiques. Don’t assume that youth and inexperience means a young person has nothing to contribute; often, a child will see something much more clearly than an adult. Above all else, though, enjoy this time with your grandchild. Spend your moments reading, writing, and creating. Doing so will only help both of you become stronger communicators… and better pals.